Origin and Habitat: Mammillaria schiedeana is endemic to Mexico in the states of Guanajuato, Hidalgo, Querétaro, San Luis Potosí, and Tamaulipas while subsp. dumetorum is found only in East San Luis Potosi and in Queretaro. Altitude: 1000-2250 metres above sea level. Habitat and Ecology: Mammillaria schiedeana ssp dumetorum is found in rather densely vegetated hill and gentle rocky slopes together with Turbinicarpus laui, Mammillaria candida, Ferocactus rafaelensis, Mammillaria pilispina, Thelocactus fossulatus, Agave xylonacantha, Agave lechuguilla, Agave stricta, and Dasylirion longissimum. Mammillaria schiedeana subs. giselae f. albiflora hort. Mammillaria schiedeana subs. giselae f. cristata hort. Mammillaria giselae f. cristata hort. Mammillaria schiedeana var. plumosa f. mostruosa hort. 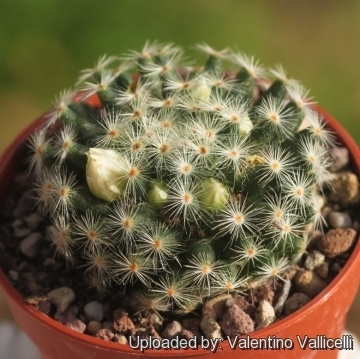 Description: Mammillaria schiedeana ssp dumetorum is a small clustering cactus, with short, closely interwoven, white plumose spines. It has less than 50 radial spines per areole and are stiffer than the fine spines of 'ssp. Schiedeana'. The flowers are near white. Habit: It is solitary to densely caespitose. The size and shape of the stems is somewhat variable from small evenly flattened rounded tops merging together very low to the ground, to form even mounds with larger headed, separately standing stems. Stem: Flattened globose, dark green, 55 mm high, 35-75 mm in diameter, somewhat soft in texture. Roots: It has thick root. Tubercles: Cylindrical, terete, tapered towards the tips, green, close together and without latex. Axil hairy, but no woolly. Radial spine: Always less than 50, mostly about 30, close to the stem, in 2 or 3 whorls, fine, needle-like to bristle-like. The 12 or14 outer marginal spines of the areoles are thin, somewhat thicker, awl-shaped, stiff, glassy white to yellowish, yellow at the base, the inner almost hair-like and thinner. Central spine: Usually absent, occasionally 1, stiff, glassy white to yellowish, yellow at the base. Mammillaria schiedeana Ehrenb. : subsp. schiedeana It has up to 120 thin radial spines per areole. The flowers are white. Mammillaria schiedeana subs. dumetorum (J.A.Purpus) D.R.Hunt: It has less than 50 radial spines per areole and are stiffer than the fine spines of 'ssp. Schiedeana'. The flowers are near white. Mammillaria schiedeana subs. giselae (Mart.-Aval. & Glass) Lüthy: It has 16-21 very thin flexible radial spines per areole, and no bristley hairs in the axils. The flowers are pinkish. Mammillaria schiedeana subs. giselae f. albiflora hort. : White flowering form. 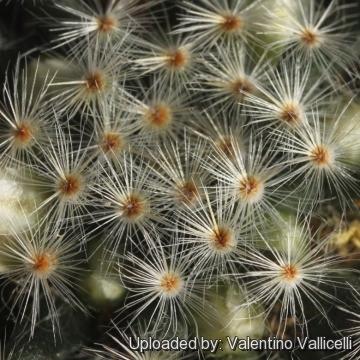 Mammillaria schiedeana subs. giselae f. cristata hort. : Crested form. Mammillaria schiedeana var. plumosa: white spined form with slightly different soft interwoven spination. Mammillaria schiedeana cv. Snowball: It forms large groups of little globes covered entirely in even longer shining-white, soft, silky hairs. 2) Edward F. Anderson (2001) “ The Cactus Family”. 6) Fitz Maurice, W.A. & Fitz Maurice, B 2013. Mammillaria schiedeana. In: IUCN 2013. "IUCN Red List of Threatened Species." Version 2013.2. <www.iucnredlist.org>. Downloaded on 05 January 2014. 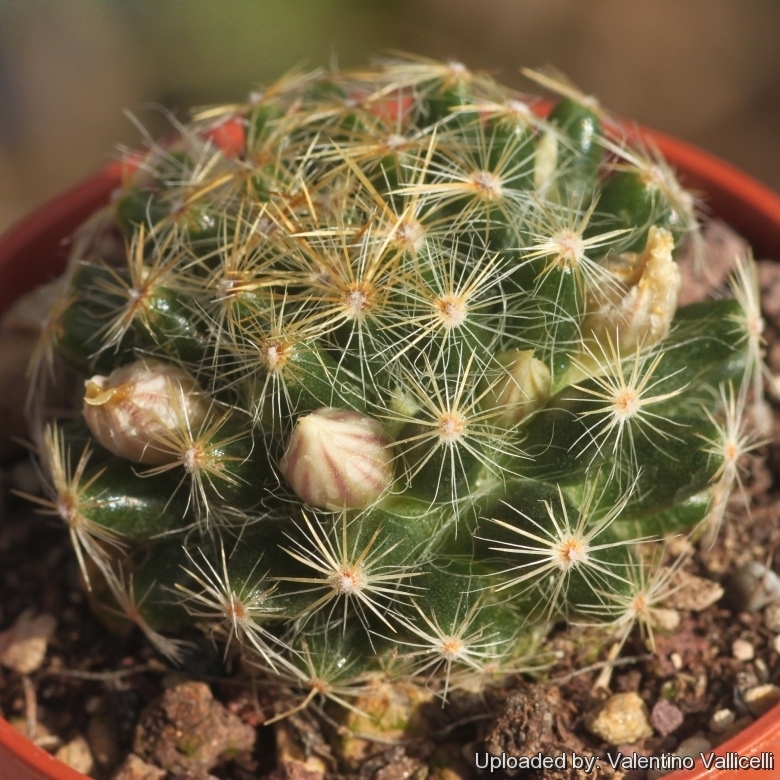 Cultivation and Propagation: Mammillaria schiedeana subs. dumetorum is a slow growing species of relatively easy culture, recommended for any collection. If grown correctly, it will reward the grower with generous displays flowers. Growth rate: It grows slowly in its natural habitat, but in greenhouses it grows more quickly. In cultivation it cluster after several years forming small mounds. Watering: It is noticeably sensitive to excess moisture, as the roots are prone to rot. Water regularly in summer, but do not overwater. Let the soil dry out between watering. Keep dry in winter. Soil: Use pot with good drainage and a very porous potting media. Sun Exposure: High levels of light are needed to flower and for good spine development. Can be sunburned if moved from shade/greenhouse into full sun too quickly. During the spring it may be able to take full sun until the heat arrives at the end of spring. In an area that has hot afternoon sun, it may be able to take full morning sun, but requires afternoon shade or afternoon light shade. Repotting: Re-pot in the spring when its roots become cramped. Generally, it should be re-potted every other year, in order to provide fresh soil. After re-potting, do not water for a week or more. For best results, use a shallow pot, and only use the smallest diameter pot that will accommodate the plant.